The Restaurant General Manager is the "eyes and ears of a restaurant". The Restaurant General Manager usually manages the business for the owner, coordinates and supervises all the activities of the restaurant. He is responsible for the financial management, due diligence and compliance, payroll, human resources, inventory, ordering, maintenance. 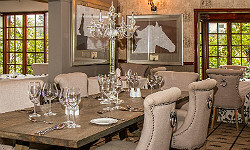 In an independent restaurant, the General Manager, works closely alongside the restaurant owner and the head chef helping with the development of the menu, costing, design, negotiating with suppliers. If in charge of a chain restaurant, he applies the rules defined by the headquarters of the company. In both cases, he ensures the daily management, elaborates the work schedules of this staff. He manages human resources and staff recruitment. Finally, he ensures the quality of the service and ensures the satisfaction of the customers. - The restaurant manager splits his time between his office, the floor and the kitchen. Please fill in the required fields. We will get in touch with you as soon as possible.